Add the iSB02 to your account to receive email notifications about software/firmware updates and more. The sensor supports 2.4GHz 802.11b/g/n network. If you have a dual band router with 2.4GHz and 5.0 GHz, please connect to the 2.4GHz 802.11b/g/n network. Why doesn’t my sensor respond after battery installation? Check the polarity of the batteries to make sure they are installed correctly. Follow the polarity indicator inside the battery chamber. Make sure you are using new AA alkaline batteries. Make sure the GREEN LED indicator is lit for a few seconds after you installed the batteries. If the battery status indicator displays “LOW” in the iHome Control App. To see the status tap (i) next to the sensor name > Battery Status. After 12 months to avoid leakage of electrolytes in the battery. How do I know if the Sensor is disconnected from the network? Notifications are sent to your mobile device advising you of any event, including if the sensor is disconnected. You can control notification preferences in the iHome Control app. How do I receive sensor notification? 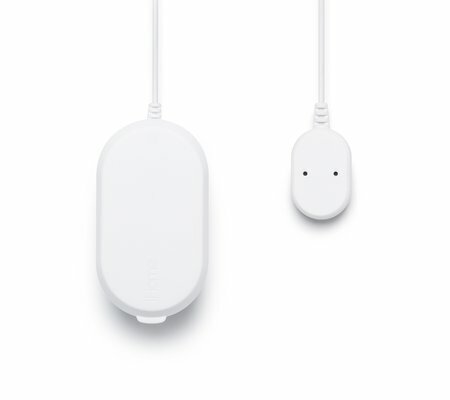 The sensor connects to your home’s Wi-Fi Network and will notify the iHome cloud of any event. You will receive a notification on your mobile device even when you’re away from home! You can control notification preferences in the iHome Control app. Can I use rechargeable batteries in the sensors? Rechargeable batteries are not recommended. Please use AA alkaline batteries only. How do I properly apply the mounting tape to my wall? We recommend wiping the surface with rubbing alcohol or soapy water (dish soap works best) and then drying the surface. Do not use alternative household cleaners since they may leave a residue that can reduce the tapes adhesion. Does my sensor work with HomeKit? HomeKit is not supported. However, IFTTT integration is coming soon! IFTTT will allow you to use your sensor in conjunction with your other popular smart home devices like lights, thermostats and more! Do the sensors work with IFTTT? Yes, the IFTTT allows you to use your sensor in conjunction with your other popular smart home devices like lights, thermostats and more. Make sure you are using a 2.4GHz 802.11b/g/n network. The device supports WPA/WPA2 PERSONAL encryption and OPEN. It is not compatible with Enterprise Wi-Fi Networks such as in colleges or businesses. Connect your smartphone to the same Wi-Fi network that you intend to connect the sensor. Make sure your smartphone and device are near the access point (router) to make sure you have good signal strength. What is the meaning of the flashing GREEN LED? The flashing GREEN LED indicates that there is communication between the device and the cloud server. What is the meaning of the flashing RED LED? The LED will flash RED twice if the sensor cannot send information to cloud server. The sensor will automatically retry to communicate with the cloud. Please check your network conditions if the sensor does not reestablish a connection (see “Setup cannot be completed” FAQ). Verify the battery status in your app. If the battery status is LOW, replace with new batteries. Press and hold the button on the sensor for approximately 5 seconds. Why does my device appear as disconnected in the app? The batteries may be depleted. Replace with new batteries. The Wi-Fi network where the sensor is connected may not be working properly. Please check your network conditions (see “Setup cannot be completed” FAQ). You may have held the button on the sensor too long resulting in a device reset. You must perform the setup process again. What should I do if I move the sensor to another network? If the new network has the same name and password, you don't need to do anything. It will reconnect to the new network using the same network credentials. If the new network has a different name or password, you must reset the sensor and perform the setup process again. Why did I stop receiving notifications? You may have accidentally reset the sensor. The sensor resets to factory settings if the action button is held for about 5 seconds. If this occurred, perform the setup process again. The sensor has a cool down time of 5 minutes from the last trigger. You need to wait 5 minutes in order to trigger the sensor again and receive another notification. How do I stop the Buzzer alarm on the leak sensor? Press and release the reset button on the unit once. When will the buzzer alarm stop after a trigger? The alarm will stop after 2 minutes (without pressing the button). Subsequently, it will beep twice every 100 seconds until the action button is pressed or battery is depleted. Are there liquids that will not trigger the leak sensor? The leak sensor will not be triggered by liquids that do not conduct or minimally conduct electricity; such as oils or deionized water. I am unable to connect the sensor to my home Wi-Fi network. Verify that your router is discoverable (must broadcast itself and not require user to type in the exact name). Must use WPA/WPA2 security (not - WEP, or WPA/WPA2 enterprise). Move the sensor closer to your network access point; the Wi-Fi signal is weak or the sensor is out of range of your Wi-Fi network. Make sure that the SSID name of your home router consists of normal characters or digits, with no space or special characters like %/#/* inserted. Reset the sensor by removing the batteries for 30 seconds. Reset your router by disconnecting it from the power outlet for a few seconds and connect it again.